More than ever, women are achieving outstanding levels of professional success. Whether CEOs, board members, entrepreneurs, or high performers, women are a game-changing force in the global economy. But women want and need to be paid appropriately for their contributions—no matter what rung of the ladder they’re on. There has never been a stronger focus on women’s pay than now, from politicians to activists to corporate America. 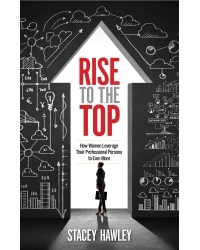 Rise to the Top is written from the inside perspective of a leading female executive-compensation advisor who understands how pay is determined and rewards and benefits are granted in corporate America. Whatever your level of accomplishment or position, Rise to the Top will help you earn what you deserve! Stacey Hawley founded Credo, a compensation and talent management firm, in 2011. Stacey is a recognized speaker, writer, and expert in compensation and talent management. Her passion for women’s compensation bloomed while spending 14 years at premier global human resources consulting firm in its world-renowned executive compensation practice, advising Fortune 500, private, public, pre-IPO, and nonprofit firms. Stacey’s expertise has been cited in publications and resources such as Money magazine, MSN Careers, CareerBuilder, the Chicago Tribune, and LinkedIn. She is a frequent contributor to Forbes, BusinessInsider.com, LearnVest, Working Mother, and The Glass Hammer.